Tapestry is a very simple and affordable way to start weaving. The loom itself is a basic square frame that allows the warpyarns to be held at tension and keeps them organized for weaving. Once the warp yarns are in place the weaver then interlaces the weft yarns with the warp to create the finished piece. With most tapestry weaving techniques the weft yarn completely covers the warp yarn. This makes a very sturdy textile that is well suited for rugs and other utilitarian purposes. It also allows the weaver to be very creative with the design. Designs can range from simple shapes to more elaborate scenes such as landscapes. The looms themselves range from a very simple square with pegs to hold the warp yarns to more complicated looms that have devices to help the weaver work more efficiently. The different types of tapestry looms are listed below. 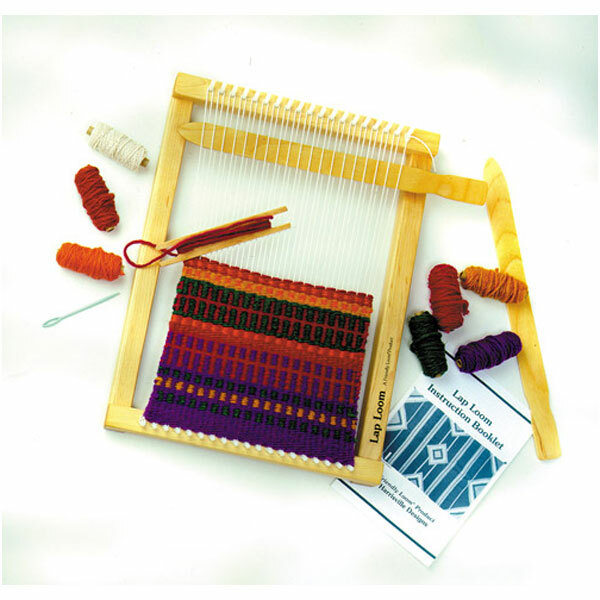 Peg Tapestry Looms: Peg looms are a simple frame loom that uses pegs to organize the warp yarns. Most peg looms are designed to be held with one hand while the weaver uses their free hand to interlace the weft yarn through the warp. Most of these looms are small so holding them while you weave, or leaning them against something for support, is easy to do. Some come with a stand, like the Schacht School loom, the Harrisville Tapestry loom, and the Glimakra Tapestry loom. The Glimakra loom has a tensioning device that allows the tension on the warp to be adjusted after the loom has been warped. The Harrisville is the largest of the peg looms with a 48” weaving width option. Tapestry looms without pegs: These looms rely on the weaver to set the spacing of the warp threads. This is done by weaving a header to align the yarns before the actual piece is woven. These looms typically are larger than peg looms and some come with a shedding device built in. Some of these looms also have ways to easily adjust the tension after the warp is on the loom. Over all this style of loom tends to be more expensive due to the size and added features that are built into the looms. Examples of these looms are the Ashford Tapestry loom, the Schacht Tapestry loom, and the Mirrix looms. 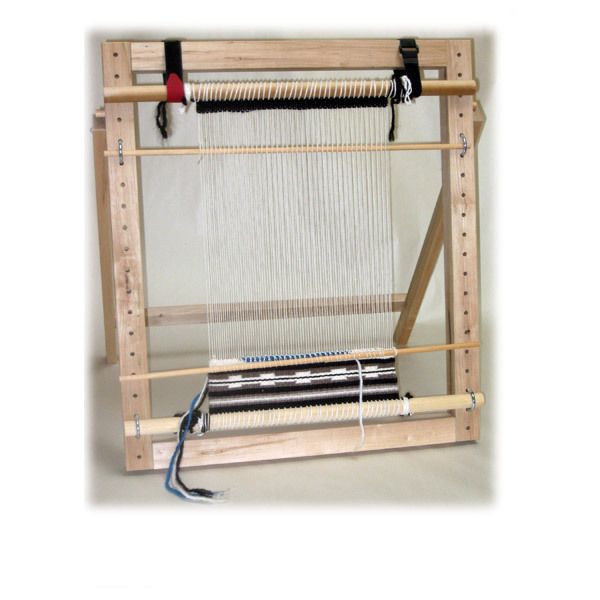 The Mirrix loom can be used with or without a warp coil to align the threads. In this case a warp coil serves the same function as pegs do on a peg loom, but the coils can be traded out to create wider or narrower spacing of the warp yarn. Navajo Looms: Navajo looms are a peg-less style of tapestry loom that is associated with the weaving traditions and spirituality of the Navajo people. They come in various sizes from lap sized to large enough to make a rug. They typically have a way to tension the warp once it is on the loom and most recommend the use of a shed stick to help facilitate the weaving process, though a shed stick isn’t required. 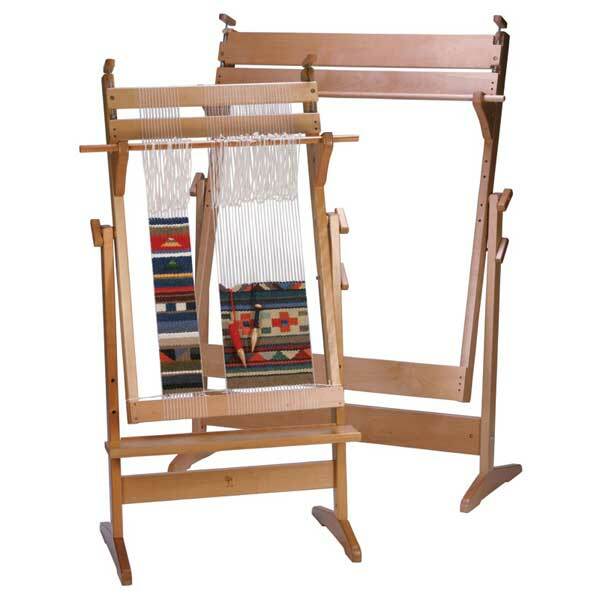 Multi Harness Tapestry Looms: The Leclerc Gobelin is a large tapestry loom with a weaving width of 36”, 45”, 60” or 100” wide. 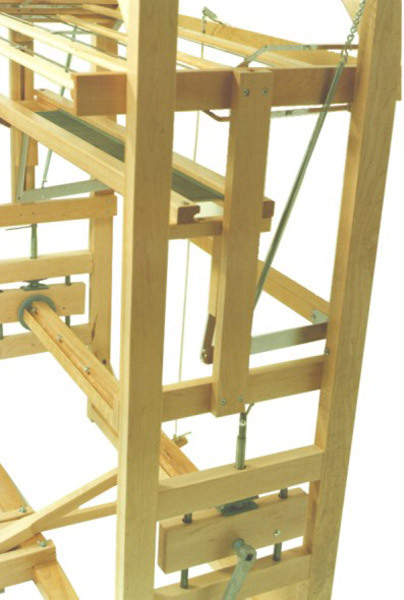 This loom can be equipped with two harnesses to make a shed like a floor loom. 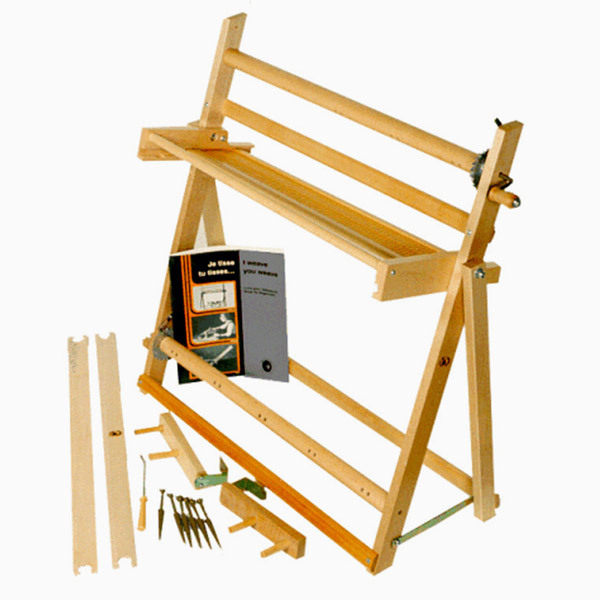 This loom is a large and sturdy loom that is suitable for making large pictorial pieces or rugs. When the loom is equipped with the two harnesses the shed is changed by the use of two treadles at the base of the loom allowing the weaver to use both their hands and feet in the weaving process. Hybrid Looms: Any loom can be used to weave tapestry, it’s just a matter of ease and comfort when doing so. Leclerc has made a hybrid of a rigid heddle and tapestry loom so that weavers can do both styles of weaving on one loom. The loom has a stand and is oriented like a traditional tapestry loom. It has a warp and cloth beam like a rigid heddle loom and it uses a rigid heddle to organize the warp threads and to create a shed. 1. The warp is made up of the yarn that is put onto the loom before weaving. On a tapestry loom these yarns are strung from the top to the bottom of the frame. On other types of looms they typically go from the front to the back of the loom. 2. The weft is the yarn that goes from right to left in the weaving process.